Once ripe on the tree Apple Greensleeves takes on a golden hue. 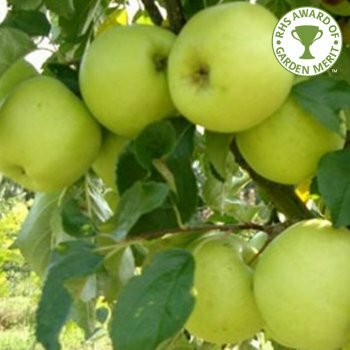 An excellent crunchy dessert apple with crisp, tangy flesh Apple Greensleeves is a good choice for growing in the garden. This apple is from Kent in 1966 and will produce its medium sized apples in September. The flavour of Apple Greensleeves mellows with age and at its prime it is pleasantly firm and sweet with a slight acidic taste. As a group B apple, Greensleeves requires a pollinator in group A, B or C.
Greensleeves is a pollination group B apple tree and requires a pollination partner in group A, B or C within a half mile radius. Apple trees should be spaced according to their rootstock, for example an MM106 (semi-vigorous) rootstock will require approx. 4.5 metres between trees, whereas an M27 (very dwarf) rootstock will require approx. 1.5 metres between trees.